If you follow us on Facebook, you might know that a few weeks ago, I purchased the Baby Foot Foot Exfoliate Peel. After walking around the house barefoot most of the time, and Gil just being a man, our feet really needed some TLC. How much we needed it, I won’t get into details, but let’s suffice it to say that when I tapped on the bottom of Gil’s feet, it sounded like I was knocking on wood. Then I came across the Baby Foot Foot Exfoliate Peel. And then I saw this picture of the Baby Foot Foot Exfoliate Peel in action and I was totally grossed out and at the same time, totally wanted to try it. The picture was impressive. The way the skin was just peeling of the foot was both repulsive and appealing. I wanted my feet to feel like baby feet. At the same time, I’m trying to use products that are more natural and aren’t packed with chemicals. As much as I wanted baby soft feet, I didn’t want to achieve it by soaking them in chemicals. 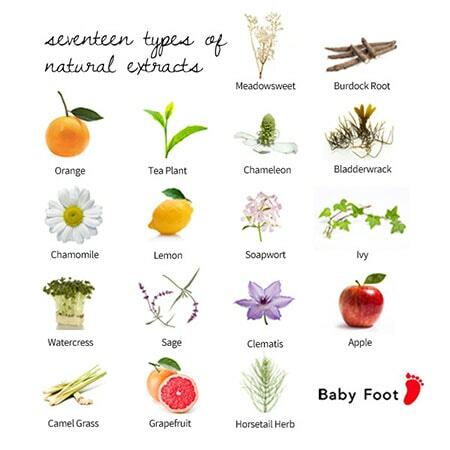 Fortunately, the Baby Foot Foot Exfoliate Peel is all natural and made with seventeen different natural extracts. I was sold. I forked over $50 ($25 for each treatment) and waited with eager anticipation for it to arrive. A few days later, the treatment was here. I opened the package and read the instructions. They’re simple enough. Soak your feet. Put on booties. Put on socks. Hang out for at least an hour while the Baby Foot Foot Exfoliate Peel does its work. Rinse off and wait. The instructions say that it can take 3 to 7 days before you start seeing any results. I’d read that some people saw results the next day, so I started checking my feet daily. Eagerly hoping that I’d start to see some peeling feet. Nothing on the first day. Nothing on the second day. Nothing on the fourth day. What if it doesn’t work on my feet? What if it only works for some people? Then on the fifth day, I had some peeling. And when I say “some peeling”, I mean “put on my socks or else I’m going to end up leaving a trail of dried skin flakes wherever I walk” peeling. TIP #1: Wear socks ALL THE TIME. Sleeping, walking around the house, running errands. When the peeling starts, your feet will REALLY peel, and if you don’t keep socks on, you’ll end up with flakes of dried foot skin EVERYWHERE. Save yourself some cleaning and reduce the gross out factor by keeping your socks on. In the first picture, you can see that the skin has peeled the most around the heel and ball of my foot. I think that’s because those are the areas that get the most friction and pressure as I walk. One thing to note is that your ENTIRE foot will peel, not just the bottom of the foot. The top of my foot, in between the toes, on top of the toes, and even around the ankle where the bootie was, ALL started peeling. You can see some of the peeling around the toes in this shot. TIP #2: The instructions specifically say to NOT “help” the peeling. This can be difficult for some. I’ve seen some people just crack and end up with a big pile of peeled skin. Keeping your socks on will help reduce the temptation to peel the skin off yourself. Try to hold out and let the ingredients do their magic. TIP #3: If you can handle it, don’t apply lotion. Baby Foot says you can use a “little” moisturizer if needed. One of our friends put lotion on her feet and it appeared to delay the peeling. In my non-scientific opinion, the Baby Foot Foot Exfoliate Peel is trying to remove dead skin, while lotion usually tries to moisturize and heal dead skin, so using lotion could counteract the whole purpose of the peel. The heels of my feet feel brand new. The tops of my feet feel baby soft. My tops toes feel super soft. To say I’m excited about the results thus far would be an understatement. If you get pedicures and have your feet scrubbed, I’ll tell you that, in my opinion, this Baby Foot Foot Exfoliate Peel is 1,000 times better than that. Your pedicurist (is that a word) would need to do some serious scraping to achieve similar results. If your feet need a refresh or you want to give yourself the ultimate at-home foot treatment, I definitely recommend the Baby Foot Foot Exfoliate Peel. The Baby Foot Foot Exfoliate Peel costs $25 per treatment (there are two booties in each box.) Order your Baby Foot Foot Exfoliate Peel today and get FREE shipping on your order. 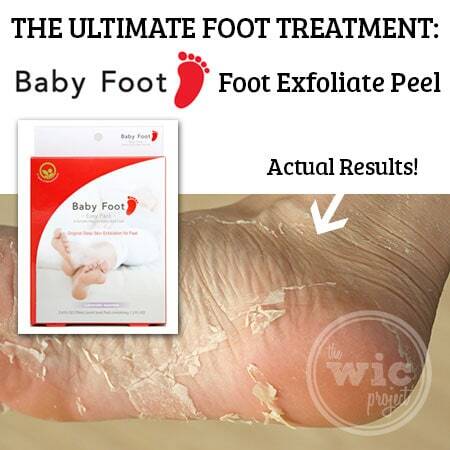 Are you going to give the Baby Foot Foot Exfoliate Peel a try? (You should!) If you have any questions, leave them below and I’ll answer as best I can. I bet my husband could benefit from it! I’m going to see if he thinks he could deal with the peeling! Wow that is super gross, yet really cool! The price is not bad because pedi’s nowadays cost at least $30 and that doesn’t get all the skin off. I am going to talk to hubby about purchasing it. Thanks for the honest review. BTW will you do a mini update when your full 2 weeks are up? Thank you for the review, I have been so eager to try this product…now that i know it really works I can start saving up the $25…That is a lot to me for just a simple one shot beauty treatment. I always do my own pedicures and manicures at home. pedis cost more than that where I live–you’ll just have to do your own toenails. Miriam, how itchy was it? Hi Denise, There was zero itchiness for me. I just asked Gil and he didn’t experience any itchiness either. Denise and Miriam – I have extremely sensitive skin and I didn’t experience any itchiness at all. I’m seven days in and absolutely loving the results so far!! Oh my gosh SO GROSS! But my feet totally need this. Wow, that is impressive. I am not a feet person, so it does gross me out. BUT seriously, who wouldn’t want baby soft feet. That’s pretty much what I thought. Every time I looked at my feet peeling, I said, “Ewwwwww!” But now, I look at them and think “Ooooh!” So worth the temporary ickiness. I’m not sure what to make of this – I cannot decide if I think it is gross or cool! Either way, I only wear socks in the winter months and during the summer we’re constantly in salt water (a natural exfoliant). I might try this…just because it’s so interesting! Oh, wow – that looks crazy! My feet are really suffering this winter, though, so I am tempted to try it! Wow! 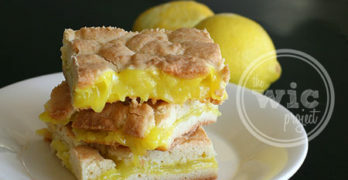 This looks disgusting but I totally want to try it! Too bad it’s kinda expensive. I have never seen anything like this before but definitely want to try it! haha, this is disgusting – and that’s exactly why I want to try it, too. oddly satisfying with great results! This stuff sounds amazing and I would love to try it. My feet could use all the help they can get. I have a major callous on the balls of my feet by the little toe. Will it remove those? Did your calluses come off? Is the product only available on line? If so, where? Hey guys…. My name is Sasha… and I can tell you her story is 1000 % true! I have had terrible feet since rejoining the work force a few months ago…. my husband was tired of me forking out the cash for pedicures that only lasted a few days at best…. When my best friend told us about baby foot he was all too happy to give it a try. I had the exact same results my first time.. the peeling was everywhere… except I did add the lotion, which i think did stop the process of the actual peeling… i am actually going to start my second treatment today and I’m really looking forward to my results ~fingers crossed~ If you want serious results you’ll give a serious look at baby foot! it’s a fantastic product. I have done it three times now and it does not hurt or leave your feet tender. I also recommend leaving the skin alone so that it falls off on its own. Pulling the skin off prematurely will hurt. I was just wondering, does one box equal one application? And did you only have to use one box/application to get results? Or did you have to apply it again a few days after the first application? I’m just trying to work out how many boxes I should buy. Hey Bryce. One box has two booties that are used for one application. We only used one box and saw results. You don’t have to reapply after you wear the booties the first time. You’ll only need 1 box. Bryce, one box contains two booties, so you only need to buy one. Wow !! This looks great! What happens when you shower? What about sweat??? It will cause the skin to loosen and come off. What happens when you shower? What about sweat??? Hi Zayda, When the skin gets wet it might tear a little easier. But you don’t need to worry about the treatment washing off or anything. 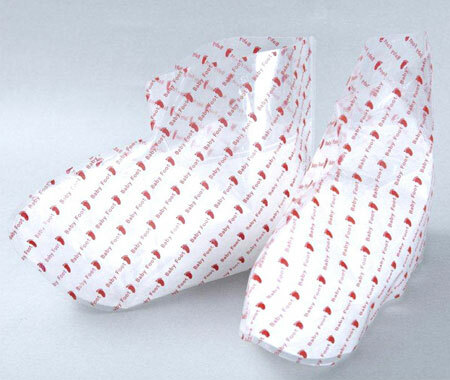 Once you wear the booties, you can proceed with your daily hygiene routine as normal. Glad to hear you experience similar results! Baby soft feet for everyone! I’d like to know if it’s okay to get a professional pedicure, I did my feet 4 days ago and yes they are peeling. I want a pedicure to speed it up. Is this OK? I don’t see why you couldn’t get a pedicure if you wanted to. I suspect the scrubbing they do would exfoliate the skin the peel would have removed, so you might see less peeling that I did.